Every year, April offers 30 days of encouragement to dust off the Keats, Neruda and Angelou, or pick up the work of emerging poets from around the country. Since 1996, the Academy of American Poets’ National Poetry Month provides events, art and curricula to millions of readers, many of whom come from classrooms and communities previously unexposed to poetry. 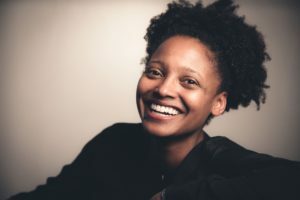 United States Poet Laureate Tracy K. Smith, whose newest collection “Wade in the Water” came out in April, curated this month’s Poem-a-Day series. The vast majority of the 26 works she chose were written by new poets. 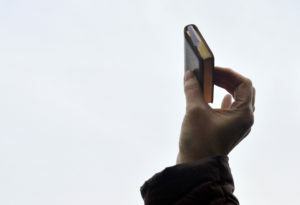 Smith shared with the PBS NewsHour by email what inspired her selections and what she hopes readers will take away from the pieces she’s chosen. NEWSHOUR: What were you looking for in your selections? What kinds of voices and themes inspired you when you made your choices? TRACY K. SMITH: I love poems that foster a sense of shared vulnerability between speaker and reader. I invited a range of poets whose work interests me. Many, but not all, are in the early stages of their career, writing in myriad brave and inventive ways about the big topics: loss, history, and the challenge to stay intact amid all the uncertainties that riddle our lives in the 21st Century. NEWSHOUR: What did you hope the Poem-a-Day audience would take away/learn from your selections? TRACY K. SMITH: That poets writing today are invested in all the many formal and thematic possibilities the art form offers. That poems are powerful tools for engaging with our big questions. That poems are great at handling high stakes. NEWSHOUR: What would you say was your favorite poem from the entire month? TRACY K. SMITH: I couldn’t possibly narrow it down to one poem. I couldn’t even narrow it down to 20 poems; there were contemporary poets popping up on weekends that are usually reserved for classic poets! That said, I love the nimble energy and the dense music in Brenda Shaughnessy’s “The Home Team.” And I’m haunted by the character of the “hastily assembled angel” in Shane McCrae’s “The Tree of Knowledge.” Kamila Aisha Moon’s “Fannie Lou Hamer” [which you can read below] breaks my heart, and makes me certain we have a good way more to go in our struggle toward looking across racial lines with compassion rather than fear. NEWSHOUR: Why do you think Poem-a-Day and National Poetry Month is important — both for avid poetry readers and those who may be exposed to poetry for the first time this month? TRACY K. SMITH: There is so much noise in our culture. So many frantic, angry, unreliable voices. So many appeals being made to us in our capacity as consumers and nothing more. The quick, glib, market-driven language that surrounds us tends to interfere with our tolerance for silence, our willingness to dwell in complexity, or vocabulary for what we are truly thinking or feeling. Poetry is an antidote to that. I think it’s a humanizing force, one that teaches us to listen to our true selves, and to value the voices and perspectives of others. Poem-a-Day is brilliant because it makes space in the everyday racket for something as meaningful as a poem. Read Kamila Aisha Moon’s “Fannie Lou Hamer” below. Copyright © 2018 by Kamilah Aisha Moon. Originally published in Poem-a-Day on April 4, 2018, by the Academy of American Poets.